“Our students and staff are still commenting on the wonderful experiences you built and encouraged around the reading of your book. Along with the students, there have a been a surprisingly large number of parents who have complimented our school for sponsoring the Thursday evening family program in the gym along with your Friday’s school wide assembly and subsequent writing workshops. Your teaching background was quite evident in your ability to keep students (and parents) of all abilities and backgrounds highly interested and on task. We had an awesome week, culminated by your two day visit. of a simulated program called "The Hacker Trail," students get to pretend they are an actual traveler on a trail heading to Oregon. They get to "pack" a wagon, and they encounter various fate cards while on the trail. These fate cards present the students with situations that travelers on the Oregon Trail may have encountered. As a primary resource, Ms. Wagner shares her incredible knowledge of the Oregon Trail in a way that brings our unit of inquiry to life for our students. Dressing as a pioneer would, Ms. Wagner shares real-life stories from her book, It Happened on the Oregon Trail, with our students during her resentation. Each year, our students have been mesmerized by the tales she tells them. 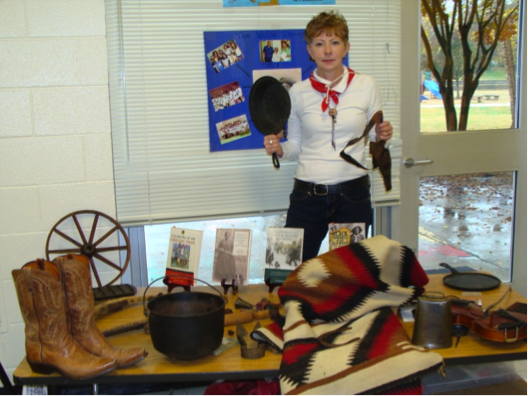 In addition, she shows the children real artifacts that pioneers would have had in their covered wagons. This experience really assists our students in the "packing" of their wagons because they are able to visualize what a pioneer might have needed while on the trail. Our students are better able to identify with the harsh "fates" that the pioneers endured after the hour we spend listening to and learning from Ms. Wagner. Thanks to Ms. Wagner, our unit has taken on a new life! The students are far more engaged in it than in years past. We are grateful for her expertise and look forward to inviting her to school for many years to come!